1.75mm/3.0mm 1kg Spool Natural Color TPU Flexbile 3D Filament - Buy flexible filament, TPU filament, flexible filament 1.75mm Product on YASIN 3D Technology Co., Ltd.
1 Kg (2.2 lbs) spool of 1.75mm Natural TPU Flexible filament. All filament is sealed in a bag with desiccant. 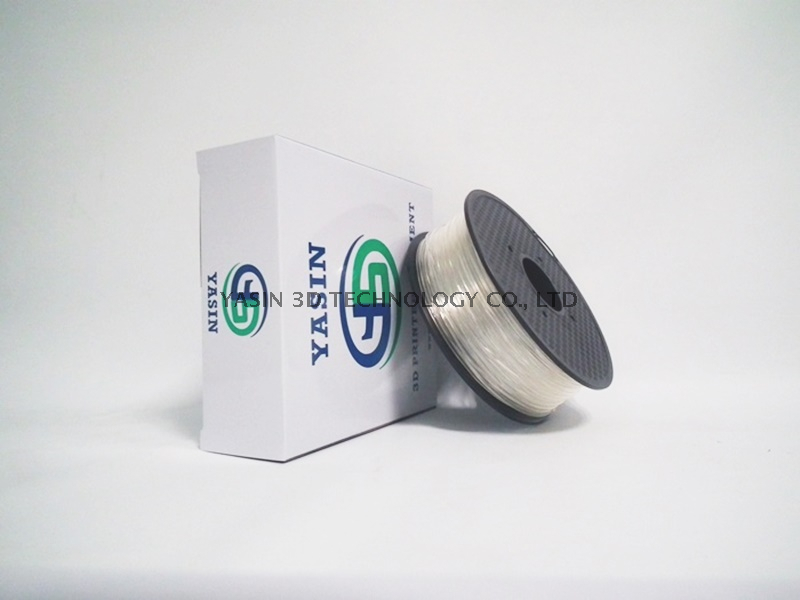 TPU (Thermoplastic Polyurethane)Filament is an elastic, oil/grease resistant, and abrasion-resistant material with a Shore Hardness of 95A. TPU Plastic has several applicable uses including automotive instrument panels, caster wheels, power tools, sporting goods, medical devices, drive belts, footwear, inflatable rafts, and a variety of extruded film, sheet and profile applications. It is also commonly used in mobile phone cases. 1） Can be used to print children children’s toys by family users, for its non-toxic and flexible characteristics. 2） With other rigia materials, it can be used to print flexible and hard combination of objects. 3） Can be used to print some daily necessities, such as disposable contact heat source, hot cup etc. 4） Can be used to print water storage items, for the layer and layer adhesion of nylon is very good.